At heart, he's a teacher. 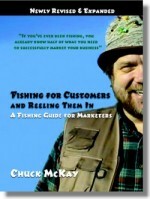 Chuck makes complex marketing issues elegantly simple." Don Parnell, Owner, Star Pawn. If you've ever been fishing, you already know half of what you need to successfully market your business. Fishing For Customers And Reeling Them In is an easy, step-by-step guide that will have you successfully marketing your business even if you've never written an ad. You'll be saying "WOW! I can do this!" We Pay The Shipping to Anywhere in the U.S.